The most recognizable name ever associated with the stunt profession is Enos Edward Canutt, known to us as simply Yak. His extraordinary feats are even more astounding when you consider they were all done in the dawn of the motion picture business. A big percentage of these dangerous gags were tried for the first time by Yak and gradually perfected by him and other early stuntmen without all the safety equipment we have on the set today. “Yakima” was given his handle by a rodeo announcer at a Colfax, WA, rodeo after Yak won the bronc riding event. Yak was born in Colfax Nov. 29, 1896, and was raised on a ranch in the Yakima Valley; hence came the nickname that would stick with him throughout his lifetime. 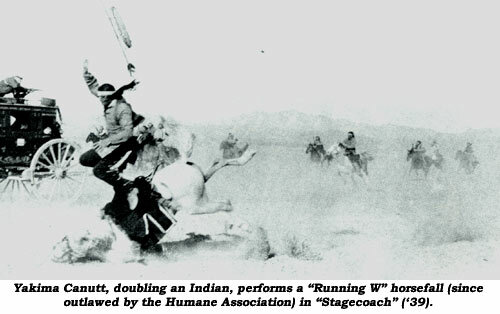 Yak competed in rodeos all over the northwest for about 10 years and finally won the all-around championship of the world in 1917, holding the title through 1923. In 1921, Yak became the only cowboy to ever ride the notorious bucking horse, Tipperary. In fact, Yak made two successful rides on this bronc after the horse reportedly dumped over 80 other top cowboys of the day. This great bucking horse was inducted into the Cowboy Hall of Fame the same year as Yak, 1976. Like many real cowboys and rodeo stars, Yak eventually found his way to Hollywood to work in the fledgling motion picture business. There were few all around stuntmen in those formative days as most specialized in only one or two things, such as diving or car driving. In the early ‘30s Yak began working for Mascot, owned by Nat Levine who was grinding out cheap westerns and serials with such future legends as Gene Autry and John Wayne. It was Yak and Wayne who perfected the art of staging a movie fight, becoming lifelong friends from this early affiliation. 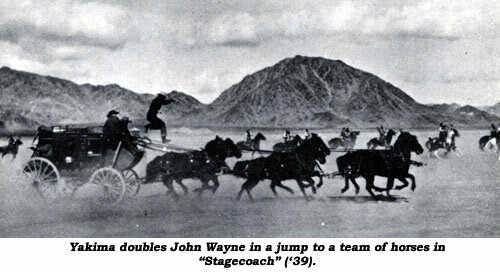 The film that established Yak as a preeminent stuntman and second unit director was “Stagecoach”, directed by John Ford. The Indian attack on the coach is still a standout almost 60 years after it was filmed. Yak continued as an active stuntman for almost another decade, but in the mid-‘40s aggressively turned to directing and second unit directing. He supervised the action on such films as “Ben Hur”, “Rio Lobo”, “Dark Command”, “A Man Called Horse”, “Cat Ballou”, “El Cid”, “Where Eagles Dare” and hundreds more. He is the only performer in the stunt profession to be honored by the Academy of Motion Pictures. Charlton Heston presented Yak with an honorary Oscar at the 1966 ceremonies. In his later years, Yak received many other honors, wrote his memoirs in STUNTMAN and attended many film festivals across America and Europe. A true pioneer in the stunt field. Every stuntman and stuntwoman owes some kind of debt to Yak for paving the way. 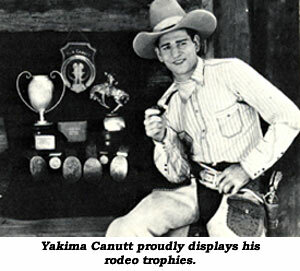 On May 24, 1986, Yakima Canutt passed away of natural causes at the North Hollywood Medical Center. Charlton Heston said it well, “Yak was simply the best that ever was at what he does.” No finer tribute can be paid.